In May 1945, activists staged a “wade-in” at a whites-only beach in Miami, protesting the Jim Crow-era laws that denied blacks access to recreational waterfront areas. Pressured by protestors in this first postwar civil rights demonstration, the Dade County Commission ultimately designated the difficult-to-access Virginia Key as a beach for African Americans. The beach became vitally important to the community, offering a place to congregate with family and friends and to enjoy the natural wonders of the area. It was also a tangible victory in the continuing struggle for civil rights in public space. 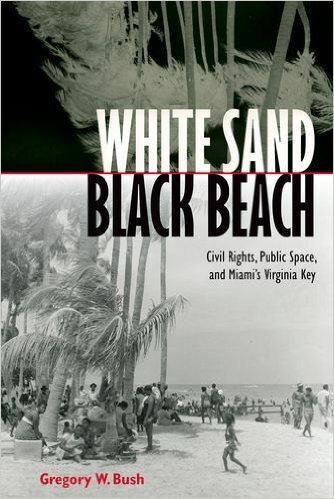 In White Sand Black Beach: Civil Rights, Public Space and Miami's Virginia Key, historian and longtime Miami activist Gregory Bush recounts this unique story and the current state of the public waterfront in Miami. Recently environmentalists, community leaders, and civil rights activists have come together to revitalize the beach, and Bush highlights the potential to stimulate civic engagement in public planning processes. A place of fellowship, relaxation, and interaction with nature, this beach, Bush argues, offers a common ground of hope for a better future. GREGORY W. BUSH is associate professor of history at the University of Miami. He is the author of Lord of Attention: Gerald Stanley Lee and the Crowd Metaphor in Industrializing America. DEADLINE FOR REGISTRATION: Thursday, February 9, 2017.